This issue contains essays how to slow the proliferation of major conventional weapons and on why international governance of geoengineering is so desperately needed; a roundtable on the overlapping relationship between the laws and the ethics of war; a feature comparing the relative moral culpability of a carbon emitter to that of a benevolent climate engineer, with three responses; and book reviews. 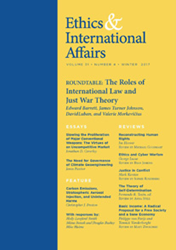 EIA occupies a unique and crucial niche in the way that it puts practical ethical questions at the center of the burning issues in international relations, world affairs, and international public policy. It is also fantastic for teaching purposes. Carnegie Council presents the Winter 2017 issue of "Ethics & International Affairs." It contains essays by Jonathan D. Caverley on how to slow the proliferation of major conventional weapons and Janos Pasztor on why international governance of geoengineering is so desperately needed; a roundtable on the overlapping relationship between the laws and the ethics of war, with contributions from David Luban, Valerie Morkevicius, James Turner Johnson, and Edward Barrett; a feature by Christopher J. Preston comparing the relative moral culpability of a carbon emitter to that of a benevolent climate engineer, with responses from Holly Lawford-Smith, Sikina Jinnah and Douglas Bushey, and Mike Hulme; and book reviews from Michael Goodhart, Ryan Jenkins, Sophie Rosenberg, Anna Stilz, and Matt Zwolinski. ABOUT "ETHICS & INTERNATIONAL AFFAIRS"